PARKERSBURG, W.Va. — A famous potato chip maker from Parkersburg will be featured in an exhibit at the Culture Center in Charleston. A group of objects ready for exhibit from a Mr. Bee Potato Chips collection. The show about Mister Bee Potato Chips opens Thursday with a reception in the Great Hall where the exhibit will be on display for an indefinite period, said Charles Morris, director of Museums for the West Virginia Division of Culture and History. “I think it’s a really neat exhibit,” Morris said. 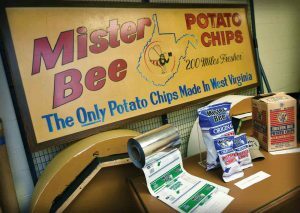 The only potato chip made in West Virginia, Mister Bee was founded by Leo and Sara Klein on Mary Street in Parkersburg. Chips were made in the morning and distributed in the afternoon. The company in 1962 moved to West Virginia Avenue in Parkersburg where its manufacturing facilities remain. Klein died in 1979. The Klein family continued to operate Mister Bee until 2010. It was purchased in September 2015 by Greg Reed, Mary Anne (Welch) Ketelsen, Douglas Ketelsen, James Richard Barton, Gregory Barton and Mary Maxine Welch. The show will include a packaging machine that once filled the familiar Mister Bee bags with potato chips and an old wood packing box for Mister Bee chips. “It’s pretty neat looking,” Reed said. Much of the display will be from historical photos and artifacts from the company, Reed said. Unfortunately, no photos could be found of the original production facilities on Mary Street, he said. Reed said the show will be an excellent way to showcase the company and its partners. The commissioner of the division, Randall Reid-Smith, likes Mister Bee’s, Reed said. “He’s a friend of Mister Bee’s,” he said. Reed and members of the sales team will be at the opening, which will be 5-7 p.m. Thursday at the Culture Center. The reception is free and open to the public. The exhibit will be on six movable panels on rollers that can be wheeled out of the way and returned when other events are held, he said. The show will follow the history of the company, from when it was established to the present day, Morris said. Also, staff at the museum shot a video of the manufacturing process, from the raw potato to the finished bags of chips.